Are These the First Pictures of HTC's New Flagship Phone? 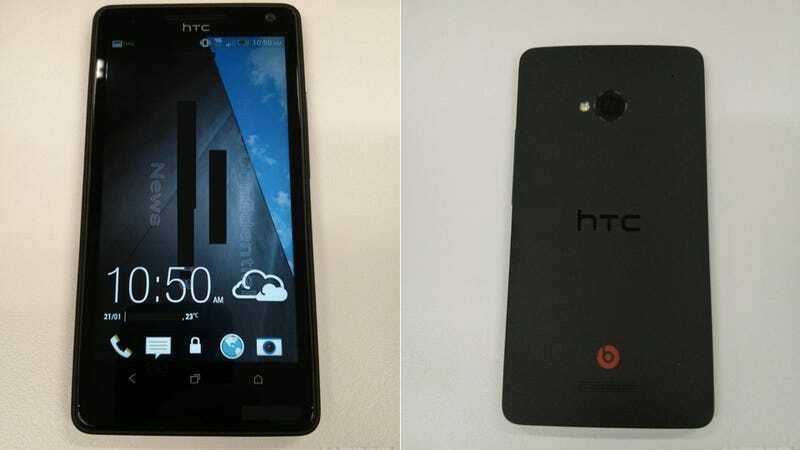 Android Police is reporting that this leaked photo depicts HTC's rumored new flagship phone, the M7. It doesn't match up with previous leaked renders—but these seem more plausible. HTC’s Next Android Flagship to Pack a 1.7GHz Quad-Core Processor and 1080p Screen? Primarily, that's because the phone in these images doesn't depart much from HTC's existing style: a neat black rectangle, matt black back, and overall fairly reminiscent of the Droid DNA. Weirdly, though, the device seems to have the usual Android home and multitasking buttons switched—which could cause more than a little confusion. The screenshot also appears to show the phone running some new software, which Android Police claims is Sense 5.0. If that's the case, it looks pretty good: simplified, sleek and a far cry from the bloated software HTC phones of old used to pack.